The V Blender (or V-shaped Mixer) is very popular for gentle blending of free flowing dry powders, granules and crystals. In particular, they are commonly seen in pharmaceutical applications due to its highly hygienic construction. 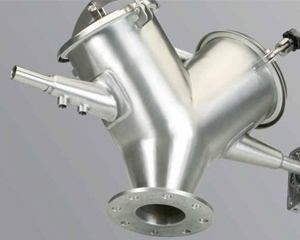 All parts of the mixer can be built in stainless steel, and the contact parts are mirror polished for complete discharge and easy cleaning. 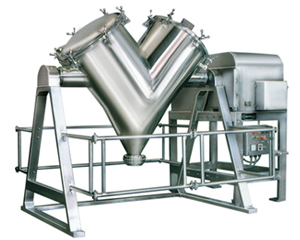 NKM designs the V-shaped Mixer for solid/solid in a proportion of up to 1:100,000 with the possibility of using an intensifier bar to enhance the mixing, and solid/liquid in powder or granulated form. 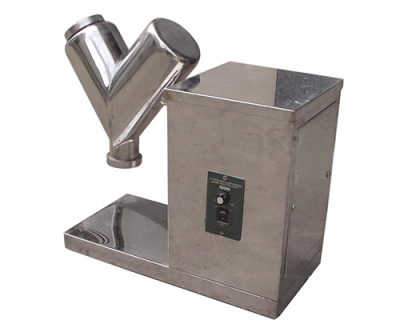 The simplicity of the V-shaped Mixer offers a low initial cost and simple operation / maintenance. Laboratory size of about 2 L is available for R&D purpose, while the industrial size of 8,000 Liters full volume is provided for production. The NKM VM series V Blender has a V-shaped body with two loading inlets and one outlet. The drive system (motor + reducer) turns the V-shaped body through 360 degree with a rotation speed of about 5-15rpm. Powders and granules inside the V-shaped body is forced to tumble up and down and collide to each other all the time, and achieve uniform mixing within very short time. Mixing time is usually 5 -15 minutes controlled by a timer. After the last rotation, the V-shaped Mixer stops at the position with the discharge valve at the bottom ready for discharging operation, which is controlled by a sensor. Safety fence and safety interlocking device can be equipped to avoid the contact by mistake when the mixer is rotating and hurts people. Mixers with wheels are also available for easy movement. Fully automation panel with PLC and touchscreen can be installed to replace the standard push-button control system.